306 pages | 40 B/W Illus. Strategic management is widely seen as essential to the public services, leading to better performance and better outcomes for the public. In fact, the private sector idea of strategic management has become so powerful in the public sector that politicians and policy makers have begun to talk about the importance of the modern state being strategic – and we may be witnessing the emergence of the Strategic State. 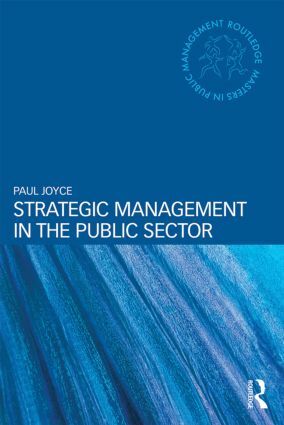 Strategic Management for the Public Sector draws on experience and research from a range of countries and provides a theoretical understanding of strategic management that is grounded in the public sector. Drawing on the latest theory and research this text provides a fresh look at foresight, analysis, strategic choice, implementation and evaluation. This book also offers original and detailed case studies based on up to date evidence from different public sector settings, helping the reader to build on their understanding of theories and concepts presented earlier in the book. Strategic Management for the Public Sector has been written specially for managers and students taking postgraduate courses such as MBAs and MPAs. It will also appeal to individual managers and civil servants in the public sector looking for an accessible book to read as part of their own independent personal development. ‘This is a unique and valuable book, which covers and tackles various aspects of strategic management and provides interesting cases and evidence from so many different countries. It is the perfect balance between theory and practice. That’s what is so important for our community interested in strategic management - academics, students and practitioners.’ - Assoc. Prof. Jurgita Siugzdiniene, dean of the Faculty of Social Sciences, Arts and Humanities at Kaunas University of Technology, Lithuania. Routledge Masters in Public Management is a series of original texts which offers students and practitioners a concise, coordinated and comprehensive learning resource. The series benefits from a coordinated format, including the use of such pedagogical features as learning points, text boxes, annotated further reading and questions for further discussion. Each volume in the series stands in its own right as a textbook which is essential reading for a particular module in a public management degree scheme. Taken together, the series offers an integrated and up-to-date collection of core textbooks and supplementary reading that can provide the backbone of any student’s study of public management – whether based upon an MBA or MPA programme, a stand-alone course or through a period of individual study. Taking an expert look at an increasingly important and complex discipline, this is a groundbreaking series. The resources represented in this series go beyond the “toolkit” or “recipe” format which does not reflect the way working in the public sector actually happens. Rather, the series encourages the reader to develop the core managerial skills and critical thinking required to excel in this discipline.